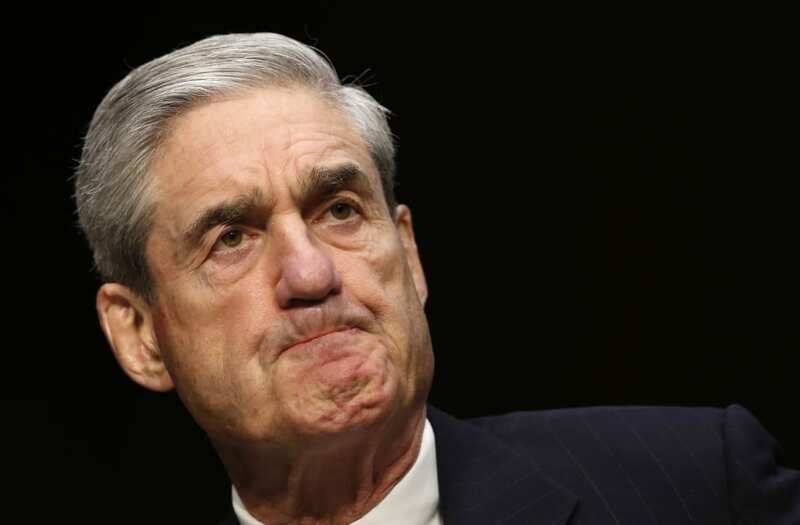 The Russia investigation took a significant step forward when reports surfaced Wednesday that special counsel Robert Mueller is questioning witnesses about what, and how much, President Trump knew about Russia's hack of the Democratic National Committee. While Trump is a focus of the obstruction-of-justice thread of the probe, he has not been a subject in the collusion inquiry — until now. "Prosecutors typically move up the food chain" in these types of investigations, said one legal expert and former intelligence official. For that reason, Mueller's latest focus means he likely has enough evidence in the collusion thread "to begin putting a story together that involves Trump." On Wednesday, special counsel Robert Mueller's investigation into whether President Donald Trump's campaign colluded with Moscow during the 2016 election reportedly set its sights, for the first time, on 1600 Pennsylvania Avenue. A new report from NBC News said Mueller is scrutinizing what, and how much, Trump knew about the Russian-backed campaign to hack into the Democratic National Committee in the summer of 2016, and whether Trump had any role in the radical pro-transparency group WikiLeaks' subsequent dissemination of the stolen emails. Mueller is overseeing the FBI's investigation into Russia's interference in the 2016 election. The probe, broadly, has two main threads vis-a-vis the Trump campaign: whether members of the campaign colluded with Moscow to tilt the race in his favor, and whether Trump sought to obstruct justice when he fired FBI director James Comey last May. Trump is the focus — indeed, the catalyst — of the obstruction inquiry. But Wednesday's report marks the first time, according to public knowledge, that prosecutors are eyeing the president as they investigate possible collusion with a hostile foreign power. Since Comey publicly confirmed the existence of the Russia investigation last year, Trump has hammered home the assertion that neither he nor his campaign colluded with Russia. "It is now commonly agreed, after many months of COSTLY looking, that there was NO collusion between Russia and Trump," he tweeted last October. Following the House Intelligence Committee's release of a controversial Republican memo purporting to show surveillance abuses by the FBI and Department of Justice when they sought to monitor a Trump campaign adviser, Trump tweeted again. "This memo totally vindicates 'Trump' in probe," the president said. "But the Russian Witch Hunt goes on and on. Their was no Collusion and there was no Obstruction (the word now used because, after one year of looking endlessly and finding NOTHING, collusion is dead). This is an American disgrace!" But Mueller's actions over the last few weeks appear to be sending another signal entirely. Earlier this month, the special counsel's office indicted 13 Russian nationals and three Russian entities, charging them with conspiring to interfere in the 2016 race by mounting an elaborate social-media disinformation campaign aimed at sowing discord leading up to and after the election. The indictment laid out a stark and highly specific picture of how the Russians carried out their scheme, which the court filing said they undertook with the specific purpose of boosting Trump and denigrating his opponent. The document did not name any Americans as willing co-conspirators, and it did not make a judgment on whether the defendants' actions had an effect on the outcome of the election — a fact the president trumpeted. "Russia started their anti-US campaign in 2014, long before I announced that I would run for President," Trump tweeted the day the indictments were unsealed. "The results of the election were not impacted. The Trump campaign did nothing wrong - no collusion!" But legal experts warned at the time that the indictment could be just the first step in a broader examination of whether — and to what extent — any Americans aided the Russians' efforts. Collusion, as Trump and his allies have repeatedly pointed out, is not in and of itself a crime. Mueller's approach to the inquiry will therefore likely be tethered to proving two key assertions: that a conspiracy to defraud the US took place by way of attempting to interfere in the election, and that Americans had knowledge of, and acted to further, that conspiracy. Wednesday's report appears to be a public confirmation of Mueller's attention to the latter. In particular, investigators are said to be interested in Trump's public appeal for Russia to recover then-Democratic candidate Hillary Clinton's deleted emails during a press conference on July 27, 2016. Mueller's new focus on Trump as it relates to Russia's DNC hack and WikiLeaks' actions "is a significant development," said Jens David Ohlin, a vice dean at Cornell Law School and an expert on criminal law. "In these kinds of investigations, prosecutors typically move up the food chain," said Robert Deitz, who served as the former general counsel at the National Security Agency. "I suspect that Mueller, through earlier interviews or documents, finally has sufficient evidence to begin putting a story together that involves Trump." The special counsel's scrutiny comes as Trump's lawyers are angling to sidestep a face-to-face interview between their client, who has shown a tendency to exaggerate the truth, and Mueller. "The one specious thing about Trump's lawyers' strategy is that they're saying there's no substantive focus on Trump when it comes to the collusion inquiry, that this is all about obstruction of justice, and that Mueller already has everything he needs from other witnesses and documents for the obstruction case," said Andrew Wright, who served in the White House counsel's office under former President Barack Obama. "Setting the obstruction case aside, what has happened over the last couple of weeks is that Mueller laid the foundation" for the collusion inquiry "by showing the crimes of the Russians, in at least some form," he said. "And now we're seeing his focus on Trump about the hacked emails. At this point, it's a matter of proving whether Americans were participants in this conspiracy to commit these crimes, and whether they aided or abetted these acts." Trump has had no known communications with WikiLeaks, an organization the US intelligence community believes is a tool of the Russian government. But candidate Trump demonstrated a marked affinity for the group in the past, repeatedly praising it in the month leading up to the November election. "It's amazing how nothing is secret today when you talk about the internet," he said at a rally on October 6, 2016, adding that he loved WikiLeaks. He also tweeted about WikiLeaks on October 11, writing, "I hope people are looking at the disgraceful behavior of Hillary Clinton as exposed by WikiLeaks. She is unfit to run." WikiLeaks reached out to Trump's eldest son, Donald Trump Jr., via Twitter direct message on October 12, telling him it was "great" to see him and Trump "talking about our publications." It "strongly" suggested that Trump tweet out the link wlsearch.tk, claiming the site would help people search through the hacked documents. WikiLeaks also told Trump Jr. it had just released another batch of emails belonging to Clinton campaign manager John Podesta. An hour later, Trump tweeted: "Very little pick-up by the dishonest media of incredible information provided by WikiLeaks. So dishonest! Rigged system!" Longtime former federal prosecutor Jeffrey Cramer, who is now the managing director at Berkeley Research Group, emphasized that while Trump's statements on the campaign trail are important to Mueller's case, they are not, in and of themselves, illegal. "It could be one data point as the investigators delve into whether there was any connection between Trump or his campaign and WikiLeaks of the Russians," Cramer said. "Relevant facts to make a case would include whether anyone connected with the campaign assisted the release in any way." Trump Jr. was in touch with WikiLeaks on multiple occasions between September 2016 and July 2017. Based on public reporting, the bulk of Trump Jr.'s interactions with WikiLeaks via Twitter direct message took place in October 2016. In addition to scrutinizing Trump, Mueller's team is also reportedly looking into Republican strategist Roger Stone's contacts with WikiLeaks, Assange, and the Russia-linked hacker Guccifer 2.0, whom US intelligence agencies have characterized as a front for Russian military intelligence. Stone worked as an informal adviser to the Trump campaign until August 2015. He was in direct contact with WikiLeaks in mid-October 2016 and they had a brief back-and-forth, according to The Atlantic. On the morning after Trump won the 2016 election, WikiLeaks reportedly messaged Stone, saying, "Happy? We are now more free to communicate." Stone's relationship with Trump has also sparked prosecutors' interest. One witness interviewed by Mueller's team told NBC News that investigators asked about what Stone's interactions with Trump were like once he ended his tenure as a Trump campaign adviser in August 2015. "How often did they talk? Who really fired him? Was he really fired?" the witness said, describing the questions they were asked. Deitz said Mueller "will continue to fill in the dots until he has enough to seek an interview with (or indictment of) Trump."